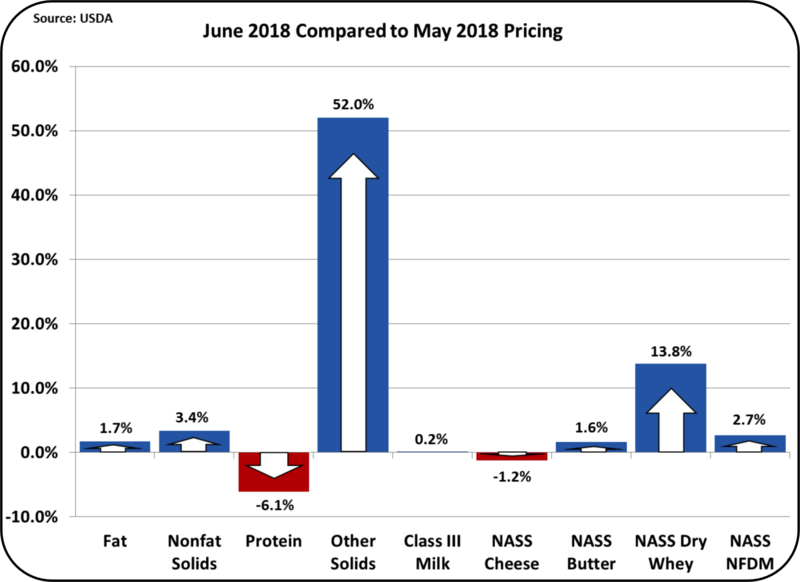 May dairy exports had some good points, but when it came to the major items that really influence producer milk prices, there was not much good news. The most important export product for milk prices is cheese. Cheese exports were down, not up. While the overall volume of exports was up 18% from the prior year, the dollar value of exports were just even with the prior year. The main reason is that what was exported was low value products like Nonfat Dry Milk (NDM) and dry whey. While butter exports were up over the prior year by a huge percentage, butter exports are so small that a big percentage increase is almost nothing. Were the Mexico tariffs on cheese to blame? The answer is, probably not, as the tariffs were announced in June and this post is reviewing May exports. The fear of a June tariff could have played a roll in accelerating May purchases, but that did not happen. Cheese is by far the most important commodity influencing Federal Milk Marketing Order milk prices. Cheese prices have been low because cheese inventories have been very high. Supplies are outweighing demand. Exporting significant quantities of cheese would have helped reduce the swollen inventories. 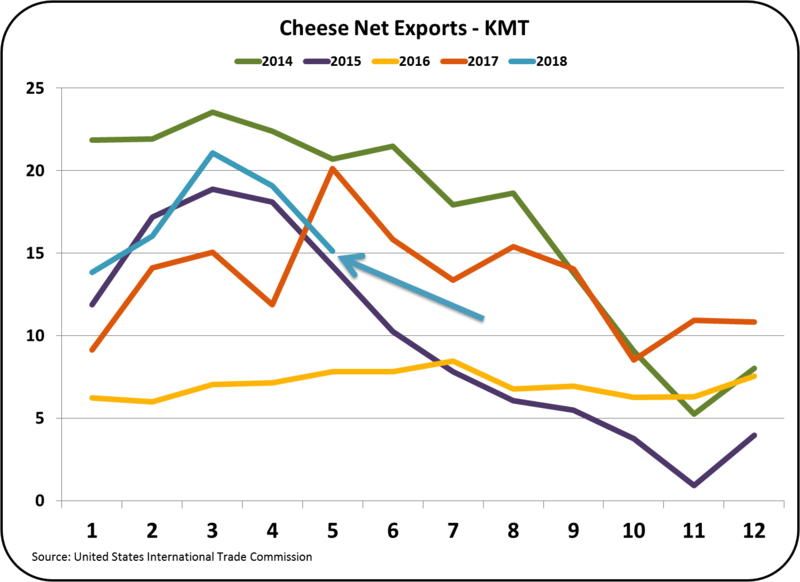 Unfortunately, May cheese exports (Chart I) were down from the prior month of April, and April was already down from March. 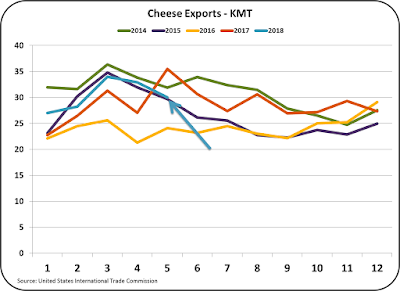 May 2018 cheese exports were also down from the year ago May volumes. Not much good news here. 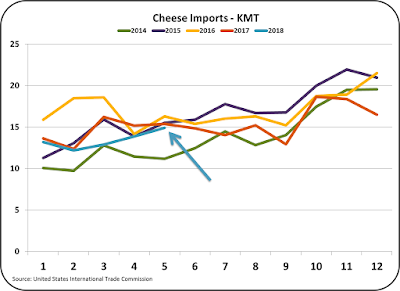 To add to the inventory issues, cheese imports (Chart II) were up! 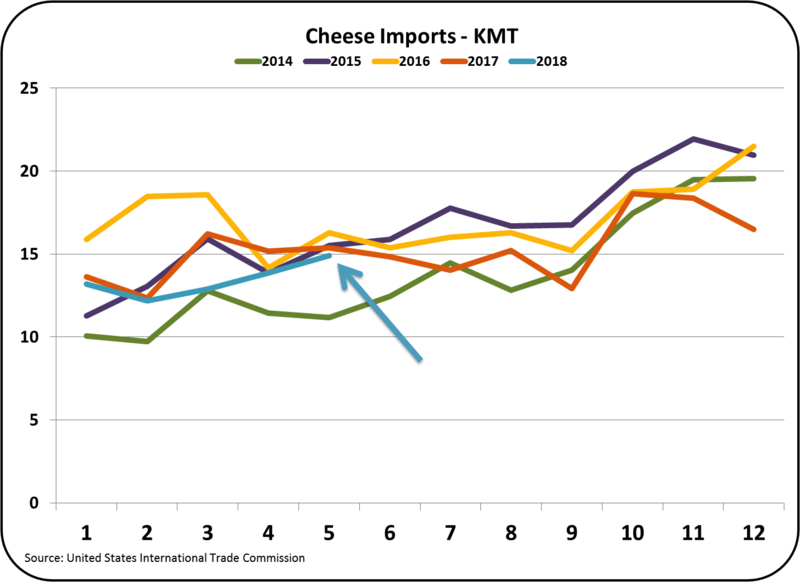 This is the third consecutive month of increases in cheese imports. When combining lower exports and higher imports, net cheese exports (Chart III) show a decline. The prior post showed and discussed the alarming growth in cheese inventory. Producer milk prices will not improve until these inventories are reduced. 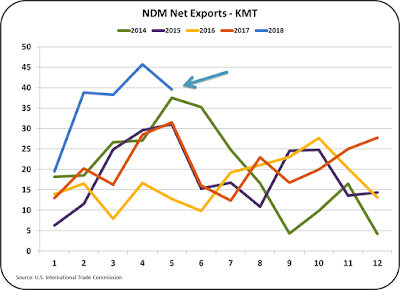 The biggest export volume mover is NDM. 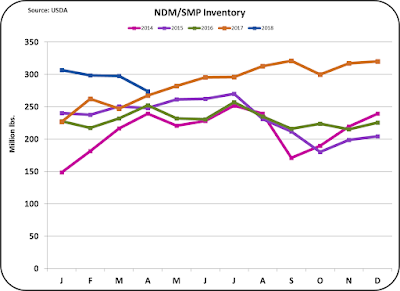 While NDM volumes are up substantially from the prior year, but in May, they did drop from the prior month. 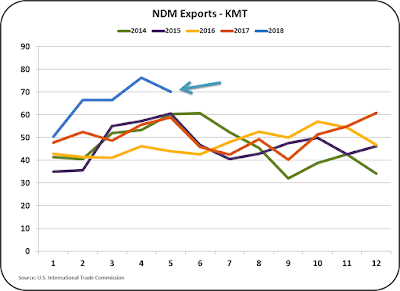 Nothing climbs in a straight line, so there is not much concern here about the NDM export volume. However, there should be concern about the NDM price of $.82/lb. Big volume increases in a competitive market require low prices. What is surprising is that NDM imports are also strong. Typically, when exports are strong it means that International prices favor the U.S. and imports fade for the same reason. That is not happening. 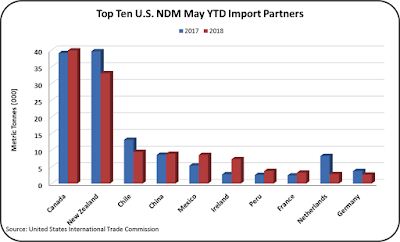 The largest source of NDM entering the U.S. is Canada (Chart VI). Canada has the same problem that the U.S. has in that increased butter consumption leaves a lot of NDM available. The nearest export market for Canada is the U.S. Canada must sell this excess NDM at a compromised price. 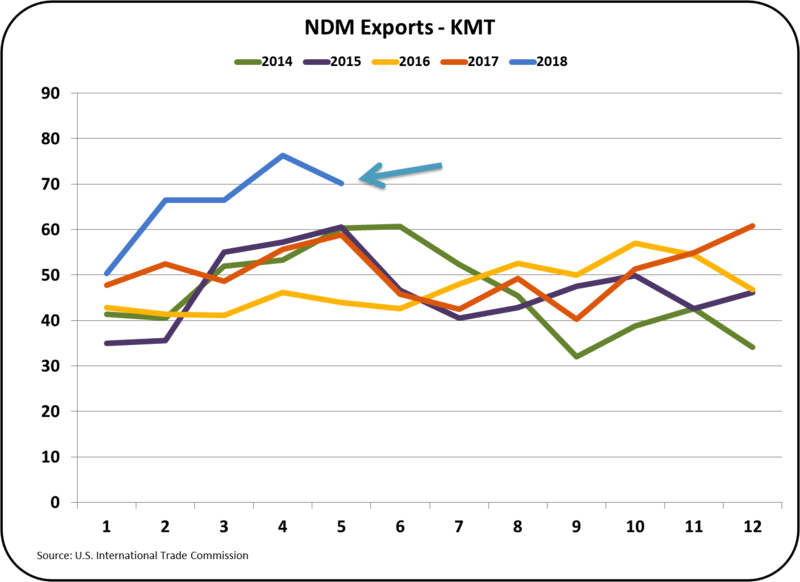 So where does that leave the NDM export effort? Right now, NDM net exports are down from the prior month and just barely ahead of the 2014 levels. 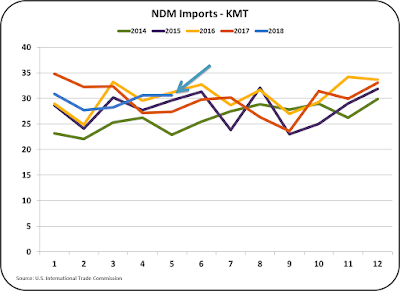 The logical thinking is that the booming exports of NDM are getting rid of a lot of the excess milk in the U.S. However, imports are at a level of almost 50% of exports, diminishing the impact of exporting nonfat dairy solids (Chart VII). 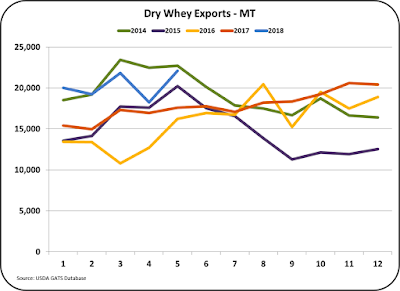 Dry whey exports are doing well. They are currently reaching the levels of 2014, when U.S. exports were setting records. There is a significant mix problem with the U.S. Dairy exports. Cheese exports are down. 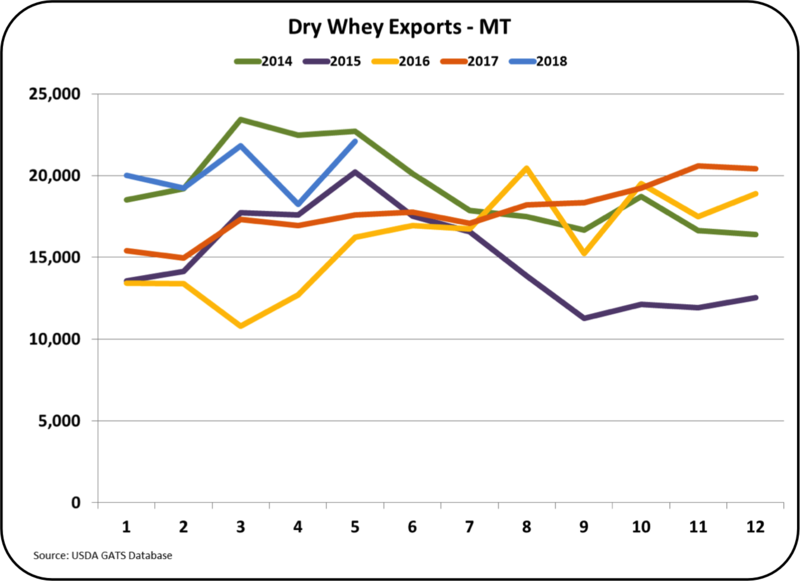 NDM and dry whey exports are doing well compared to prior years. The problem is that cheese is expensive, and NDM and dry whey are very inexpensive. 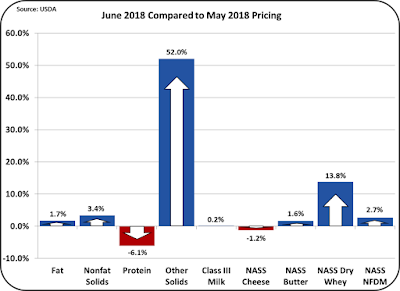 For the month of May, the NASS price for cheese was $1.61/lb. while NDM was valued at $.82/lb. and NDM was valued at $31/lb. The current mix provides lower total revenue despite the increased volume. More cheese exports is what is needed to improve producer prices.. The export emphasis needs to focus on cheese to provide a pay back for the producers who financially support the USDEC. June Class and Component prices were announced on July 5. With one exception, prices saw very little change from the prior month. The 52% increase in the price of other solids dominates Chart I. Other changes were minimal with the Class III price increasing by .2%. Cheese prices were down slightly, which reduced the milk protein price by $.08/lb. 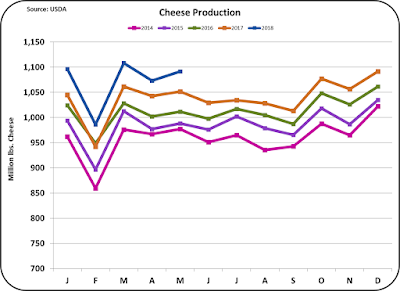 A drop in the cheese price usually causes a drop in the Class III price, however the increase in the price of other solids offset the loss to make the Class III price slightly positive. Why did cheese prices drop? 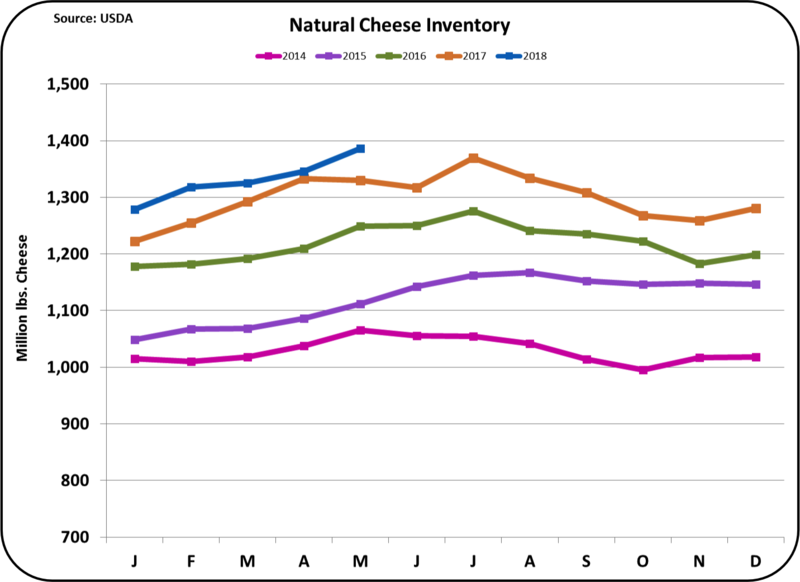 Cheese inventories (Chart II below) were again up substantially. Before any meaningful increase in the Class III price can be attained, cheese inventories must come down. 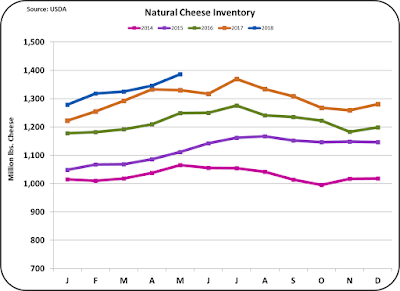 A lower inventory will force an increase in the price of cheese and an increase in the Class III price. How high was the cheese inventory increase? It was roughly twice the 2% growth rate of domestic cheese consumption compared to the prior year. 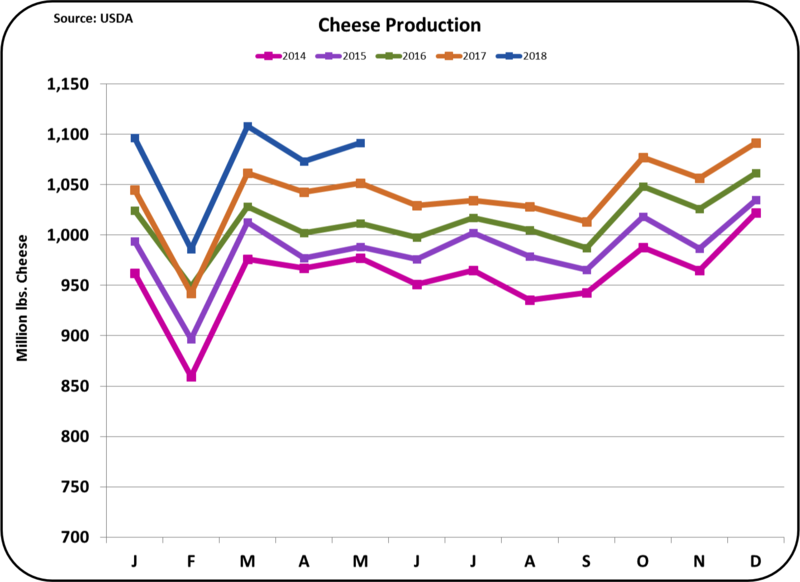 Compared to two years ago the growth in inventories is roughly five times the growth in domestic cheese consumption. 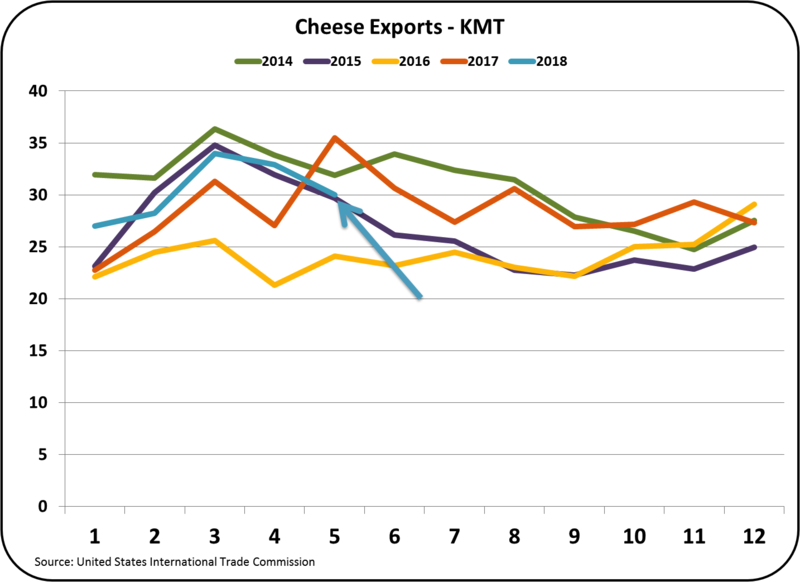 The growth in cheese exports can only absorb a small part of this increase. What is behind the growth in inventories? Over production of cheese caused by over production of milk is clearly the culprit. While there are lots of news headlines about new tariffs on cheese exports, the problem is really right in the U.S. With the drop in fluid milk consumption the increases in U.S. milk production cannot be sustained. Parking the excess milk in cheese inventories buys time, but it is not a solution. In the June 12 post to this blog, the huge increase in Nonfat Dry Milk (NDM) exports was covered. 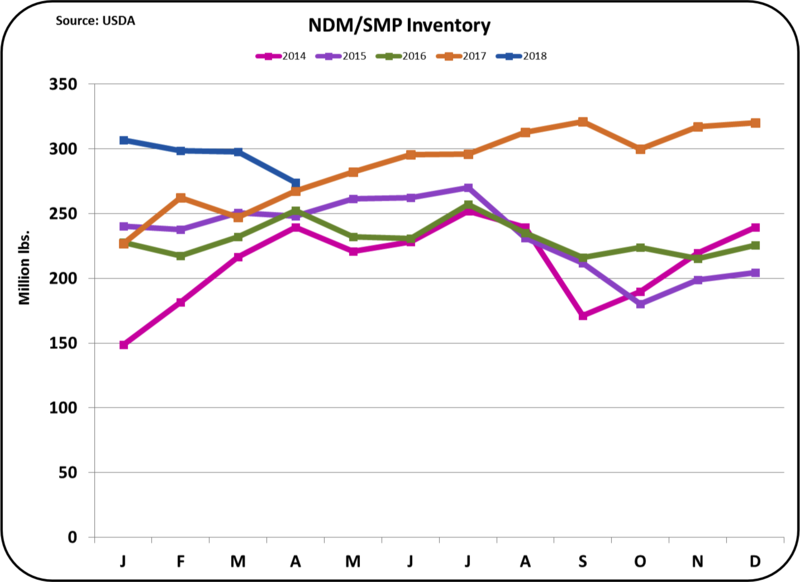 It was impactful in reducing the inventories of NDM (Chart IV below). 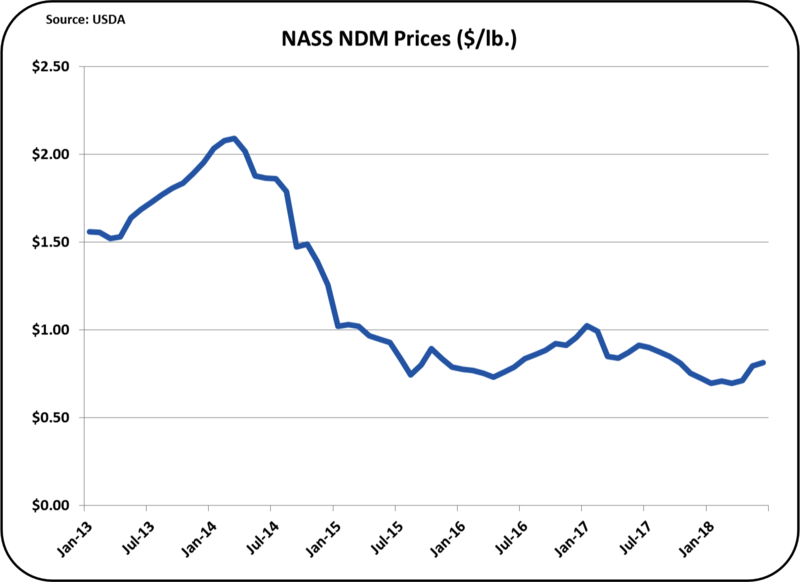 While the price of NDM is primarily dictated by international prices, there was a slight upward tick in the price of NDM, which in-turn gave a slight upward tick to the Class IV skim price. 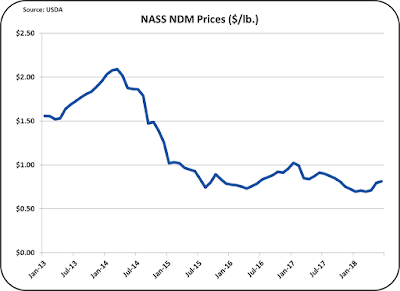 While any increase is helpful, the price of NDM is still in low range of under $1/lb. where it has been for the last three years. The excess global supply of NDM and Skimmed Milk Powder is keeping these prices low. The big increase in the value of other solids is linked to the increase in dry whey prices. 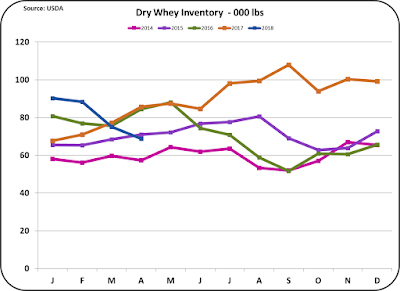 Because the drying price of dry whey comes close to the total value of dry whey, relatively small changes in the price of dry whey can have a big change on the price of other solids. The cost to dry whey is $.1991/lb. 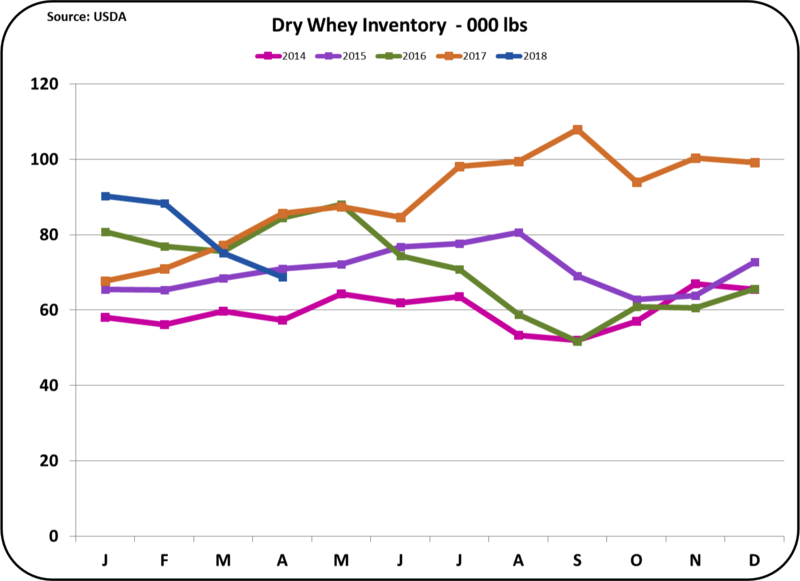 and the value of dry whey has ranged in 2018 from $.25/lb. to the current price of $.31/lb. That is why a 13.8% increase in the price of dry whey can calculate to a 52% increase in the value of other solids. What caused the huge increase in dry whey prices? Chart VI below shows the huge drop in inventories in 2018. 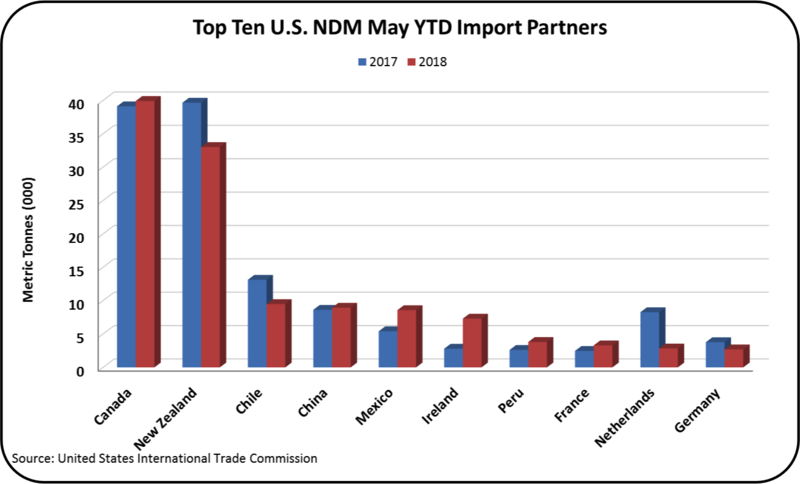 U.S. dairy values remain stuck at moderate prices with a number of shifting parameters like domestic consumption, milk supply, and international events that impact exports and imports. Posts to this blog will continue to provide accurate and unbiased insights. As California moves closer to becoming an FMMO, more posts will provide information on what is happening in California and how it may impact the total U.S. dairy industry. Getting California's dairy payment system into a Federal Order has been a long process. It is now a done deal to be implemented before the end of 2018. Will there be some unexpected impacts of this change? This post will explore how the Producer Price Differential (PPD) may influence pooling and de-pooling. Under the CDFA payment system, de-pooling was not allowed. As a Federal Order it will be allowed for milk Classes II, III, and IV. De-pooling allows members to drop out of the FMMO temporarily when there is a financial penalty for staying in the pool. The PPD can create that penalty. The PPD and its impact on the California FMMO were initially discussed in the second half of the May 27, 2017 post to this blog. It was covered in more detail in the September 2017 article in Progressive Dairyman. That was one year ago, and the probable dynamics have changed. The Class I price is determined in advance of the month and the Class III is calculated at the end of the month. Therefore, when cheese prices are increasing, the Class III price may be higher than the Class I price. This can cause the "Uniform" price to be lower than the Class III price. When this happens, the PPD can become negative. That would require the producer to pay money to the FMMO fund. However, a producer or his agent can elect to drop out of the pool (de-pool) and not be a part of the FMMO to avoid that payment. Class I milk is not allowed to de-pool. All other classes can de-pool. In the case of California, the vast volume of Class IV milk and the shrinking Class I volume can also make the PPD become negative. In March 2018, the Agricultural Marketing Service issued a 33 page paper entitled "Regulatory Economic Impact Analysis of the Final Decision to Establish a California Federal Milk Marketing Order." The final analysis is based on establishing the California FMMO just like all the other FMMOs paid on the component system. In the analysis, the impact discusses the similarities between the Upper Midwest FMMO and the California FMMO. In reality, the two orders are very different. 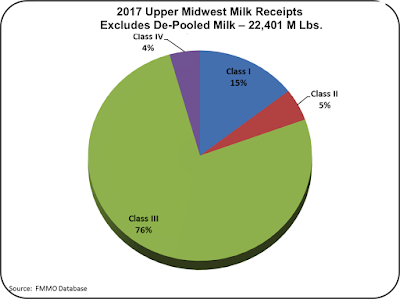 Below in Chart I, is the Class mix of milk for 2017 for the Upper Midwest, as reported by the FMMO. Class III, milk for cheese makes up 76% of the total milk usage. Class IV, milk used for butter and skimmed milk, is only 4% of the Upper Midwest volume. Chart II below is a fabricated chart, which attempts to include all the milk in the Upper Midwest that was "de-pooled." This milk is not considered to be FMMO milk and is not reported in FMMO numbers. How much was de-pooled? 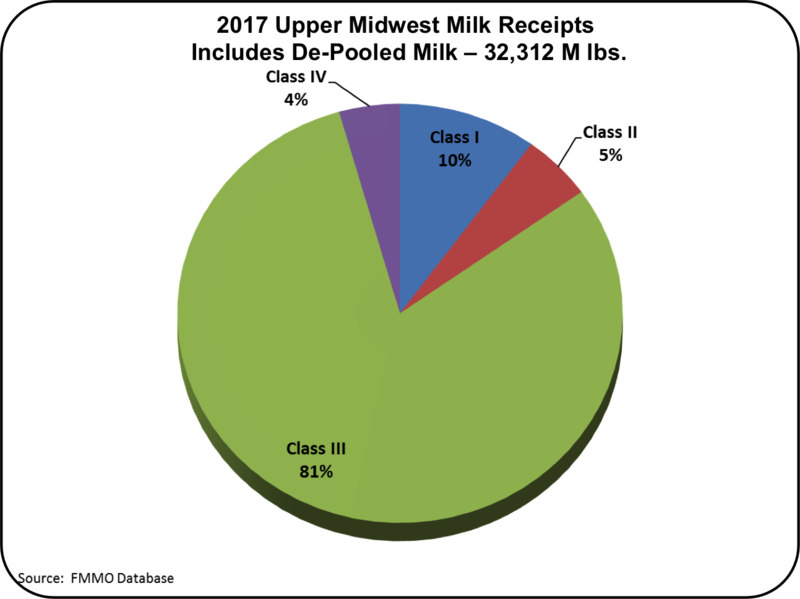 Nearly one third of all the Upper Midwest milk was de-pooled in 2017! In reality, 81% of the milk produced was used for cheese. 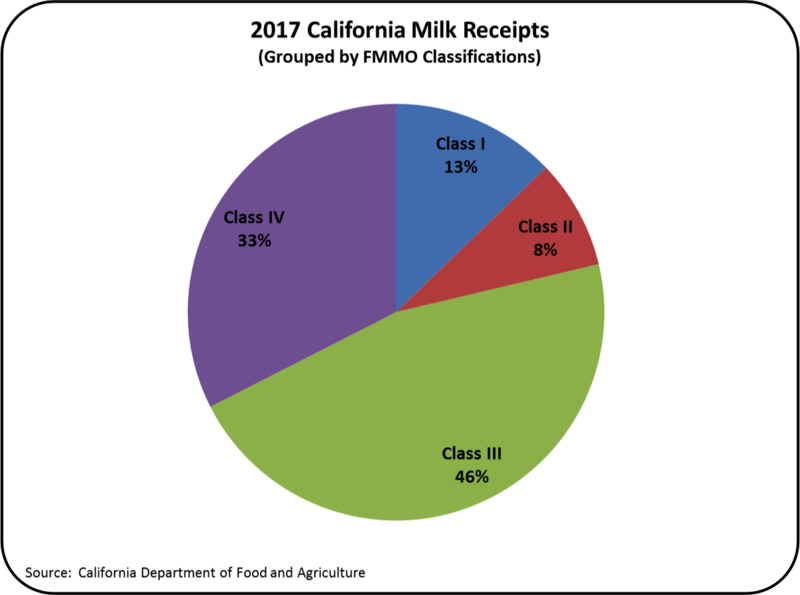 Chart III below shows the California milk usage by FMMO classifications. There will be some slight modifications when the exact definitions used by the FMMOs are in place, but it will not significantly alter the numbers in Chart III. The really big difference between the Upper Midwest FMMO and the California FMMO is the vast production of Class IV milk in California. Only 4 percent of the milk in the Upper Midwest goes to Class IV usage while 33 percent of California milk goes to Class IV usage! That is a huge difference that will impact California as an FMMO. Class IV prices are very low with no change in sight. That will significantly reduce the Class IV price. What do we know about the trends in milk usage that will further influence the PPD? Class I, the high priced milk is rapidly declining in domestic consumption. See the recent post to this blog for details. The price of Class IV milk is declining as the consumption of butter increases and that leaves excess skimmed milk available globally. Excess skimmed milk means lower Class IV prices. In the case of California, Class IV is significantly bigger than Class I, and that volume difference will continue to grow in favor of the Class IV volume. Based on the 2017 milk volumes in California, the PPD for the California FMMO would have been negative in 15 of the most recent 17 months comprising 2017 and 2018 YTD. In 2018, it has so far been negative every month. As the consumption trends continue, will the California PPD ever be positive? If one third of the Upper Midwest was de-pooled in 2017, how much of the California milk will be de-pooled? The de-pooling rules are a bit complex and will likely change many things including the storage requirements of the processors. Pooled and de-pooled milk must not be arbitrarily mingled. More on de-pooling will be covered in a future post to this blog. The PPD "game" will bring real change to the California dairy system.